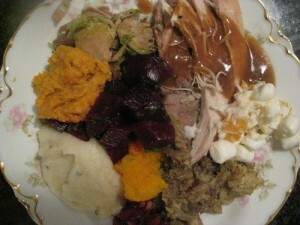 I have a nickname for Thanksgiving: The Brown Meal. You have your brown turkey, brown stuffing and brown gravy. And then there are white potatoes that get smothered in that brown gravy, plus a host of other complementary (that is to say, dull) earth tones such as orange (yams and sweet potatoes), green (cabbage and Brussels sprouts) and beige (ambrosia and Waldorf salad). Whoever said you eat first with your eyes? He might want to close his before picking up a fork at most American homes next Thursday. I’ll tell you — I’m thankful for the splash of red that the cranberry sauce brings to the plate. And so is Leslie Orlandini. 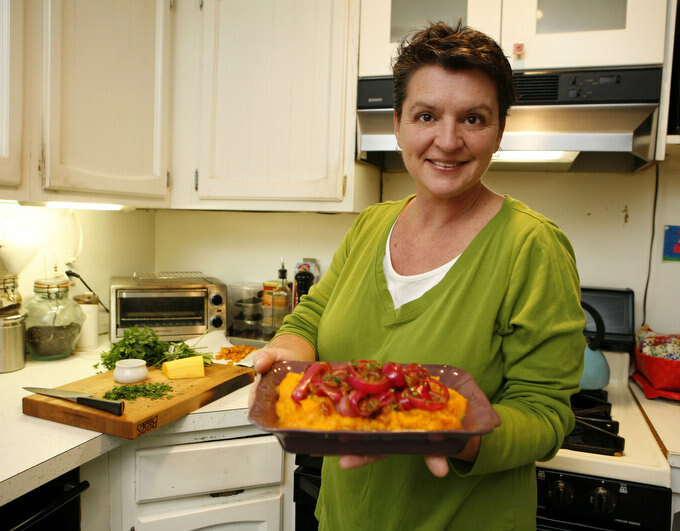 She’s a professional food stylist who lives in West Nyack and has worked for the Food Network, Martha Stewart and Rachael Ray. It’s her job to make food look beautiful. And she did just that for Rachael Ray’s newest book, “Look + Cook,” which has more than 600 photos. And it doesn’t hurt that all those things make food look great, too. 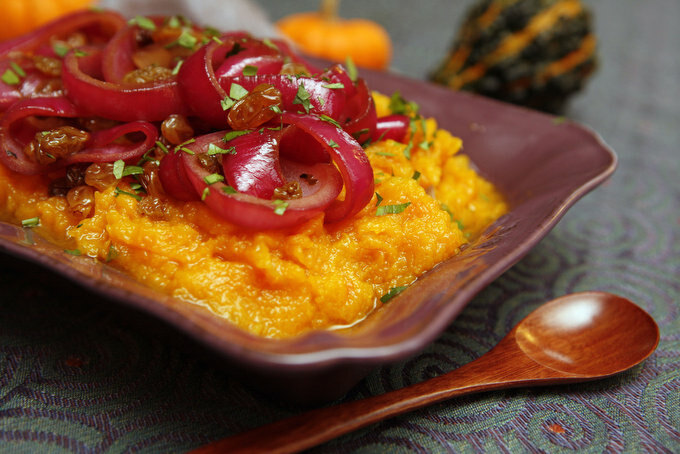 A couple of years ago, Orlandini started garnishing her butternut squash with a pickled red onion mixed with golden raisins. And that’s the key to making the foods on your Thanksgiving table sparkle: Garnish them thoughtfully. One of my family’s favorite Thanksgiving hors d’oeuvres is a simple chilled shrimp cocktail. You could certainly throw the shrimp in a bowl and open a jar of cocktail sauce. But with a little planning, your platter can shine. Why not lay a couple of banana leaves down first, so you have a shiny, bright green background. Then slice a few lemon wedges and twist both of their ends so they spiral. 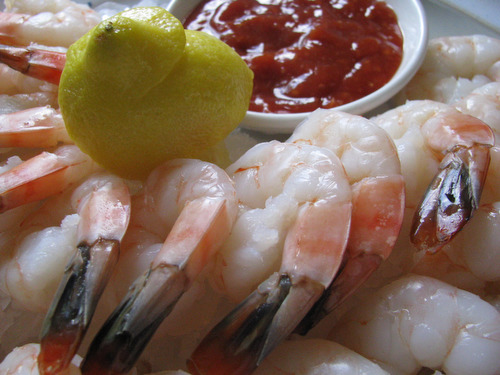 Then lay down the cold shrimp in concentric circles, and garnish with those spiral lemons. Add a glass bowl of red cocktail sauce, and now you’ve got something as good to look at as it is to eat! Herbs are an easy way to garnish and bring a contrasting color to the platter. Variegated sage makes a lovely bed for the turkey. Chopped scallions can decorate squash, mashed potatoes or even stuffing. And sprigs of thyme or rosemary — even dill or tarragon — make lovely toppers, like a feather in the cap of your Thanksgiving salad. And citrus is always welcome. A few orange twists can surround the Brussels sprouts or top the cranberry sauce. Lime zest sprinkled on top of the yam puff will do wonders. And lemon twists aren’t just for drinks. They taste — and look — great with almost any dish on the table. • Make a shallow bowl in your mashed potatoes and put a scallion salsa in it: scallions, cilantro, lemon juice and garlic. People can grab some salsa as they scoop the potatoes. • Make a gremolata — garlic, lemon zest and parsley —and use a teaspoon or so to garnish each person’s serving of turkey. • Chop roasted peppers to top your Brussels sprouts. • Roast pepitas to top green beans or cabbage. • Serve pearl onions with a parsley pesto rather than cream. • Make a balsamic reduction rather than gravy for your turkey. • Mix regular and sweet potatoes for your mashed; they’ll turn out a lovely pink color and won’t rock the boat for traditionalists. Even if you use just one of our suggestions, you’re sure to see The Brown Meal in a whole new light. And then,?I guess, I’ll have to come up with a new nickname. Next Article Today in the Food Section: Thanskgiving Edition! Food Styling, Freezing, Leftovers, Recipes and More!